When I switched from chemical engineering (my undergraduate degree) to political science and human geography (my doctoral degree), I went through economics of technical change and international marketing (my Masters). But the chemical engineering component was still very strong during my Masters. I remember reading comments from a professor’s marker (yes, my professor didn’t even grade my essay!) saying “lacks analysis“. WHAT THE HELL IS ANALYSIS IF NOT WHAT I AM WRITING THEN?! The Craft of Research. (by Booth et al) Shane Gunderson, Cheryl Van Den Handel, and Jay De Sart recommended this book, which I have read and own. This is a book on how to undertake social science research, and it’s one I definitely recommend too. They Say, I Say. Omar Wasow recommended this book, seconded by Jackie Gehring. 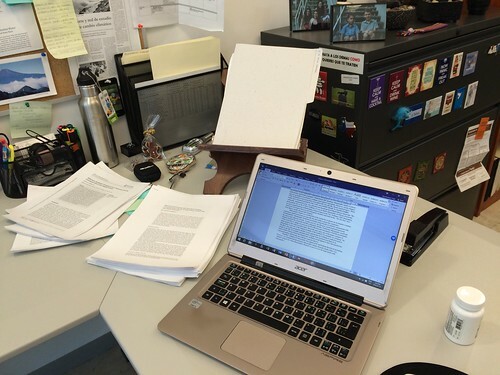 Erin Ackerman, author of the “Analyze This: Writing in the Social Sciences” chapter of “They Say, I Say” book, mentioned that her chapter Chapter 13 is focused on social sciences’ writing and a few political science examples. Empirical Research in Political Science (by Leanne Powner). I had heard of Leanne’s work before and I *thought* I had a copy of this book, but I think it’s one of the ones I lost at MPSA 2016 (don’t ask). So, I’ve requested an examination copy and will report back once I’ve read it. Matthew Parent recommended a handout by John Gerring et al (yes, Gerring from case studies! The excerpt is from Gerring and Dino Christenson’s forthcoming book). I love both Gerring and Christenson’s work so I’m always happy to promote it. I found through Google a few handouts, but these three were the ones that stood out to me, and were also the simplest for me to refer my students for a reading. Summary vs. Description vs. Analysis vs. Argument. One handout I found clearly describes the differences between summary, description, analysis and argument. This one is an anthropology-focused one. This checklist tells the reader how to distinguish between description (telling things how they are, detailed accounts of facts and data) and analysis (explaining the implications, tying theory and empirical evidence to the description). This short guide from the University of Birmingham Writing Centre on critical thinking and the differences between analytical and descriptive writing really outlines when you use description, when you should be analyzing and how to differentiate between both. This one-pager on the difference between analysis and synthesis is also very good. Over on The Research Companion Facebook group, I got a few responses. Dr. Helen Kara recommended her book: Research and evaluation for busy students and practitioners. A time saving guide (having read some of her work and writing, I can vouch for it!). Sarah Howcutt shared with me a couple of handouts where she clearly explains what description is and how to insert analysis into your paragraphs. I then searched my own Mendeley library for examples of good articles I had read that could show my students what analysis looks like, vis-a-vis descriptive text. Here are a few examples I tweeted. The first one is from a World Development 2014 article by Alison Post and Veronica Herrera on public service delivery in Latin America (focusing on water and wastewater). Here, I wanted the reader to see how Herrera and Post set up a comparison between what the literature says versus what their own analysis shows.
.@veromsherrera Note that here @veromsherrera and Post analyze the literature on privatization and offer their own analysis of what it fails to account for. This example comes from Kathryn Harrison’s 2002 Governance article comparing US/Canada/Sweden and dioxins control policy. This paper investigates the role of ideas, interests and institutions on policy change. In this example, I wanted to show how Harrison weighs evidence from each one of the three case studies and evaluates the differential impact that ideas, interests and institutions had on policy evolution.
.@khar1958 Note that while @khar1958 finds compelling evidence of impact of ideas, she points out to interplay of ideas, interests AND institutions.
.@khar1958 This is important when we teach students to offer evidence. We need to tell them to offer alternative explanations, weigh evidence/results. I then used Josh Cousins and Josh Newell’s article on political-industrial ecology in Los Angeles’ water supply infrastructure to show the reader how Cousins and Newell present descriptive text on Los Angeles and its water supply and then connect it to the literature through analysis.
.@JoshJCousins I used pink to denote descriptive text, and orange to show where Cousins & Newell link the description above with theoretical underpinnings. I used Megan Hatch and Elizabeth Rigby’s article on state-level governments as laboratories of democracy and their study of state-level inequality to show how you can use data (quantitative, in this case) to create an argument and dispel previously held beliefs/preconceived ideas/previous theoretical and empirical findings with their own. I also used a paper by Melissa Merry on tweeting and the framing of gun policy using the Narrative Policy Framework. In this example I wanted to show how Merry mobilizes her empirical findings to construct a new measure and to explain the theoretical and empirical implications of her findings. From David Carter and Chris Weible’s study of smoking bans in Colorado in 1977 and 2006, I drew an example where I show how Carter and Weible set up an empirical question (a hypothesis) and then use their data to explain differences between both smoking bans. Another way in which researchers show they’ve done analysis is in case study selection. In this paper by Rob de Leo and Donnelly, they do a study of policy transfer and the adoption of the Affordable Care Act in Massachusetts. De Leo and Donnelly clearly outline the various reasons why choosing this particular case makes sense. I am thankful to everyone who provided me with links to books, handouts, etc. And I hope this blog post will be useful to anybody who needs to teach analysis vs. description. I certainly will be using it with my own students and research assistants! Tagged with academic writing, analysis, synthesis, writing.